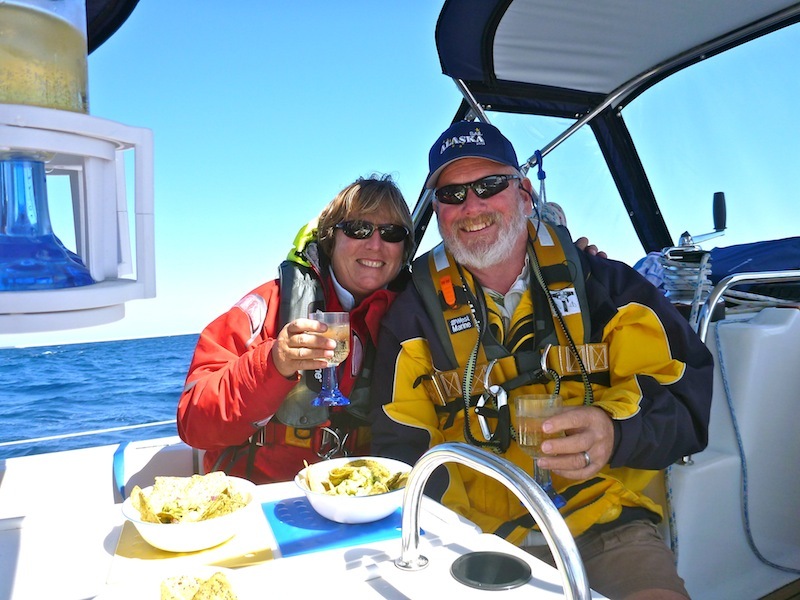 San Diego to Cabo San Lucas…Baja Ha Ha 2013! Four hands on the wheel for another big day! Plenty of company for our ride south! As if to remind us that it’s nearly November in San Diego, we woke to a drizzly cold morning for the start of the 2013 Baja Ha Ha. 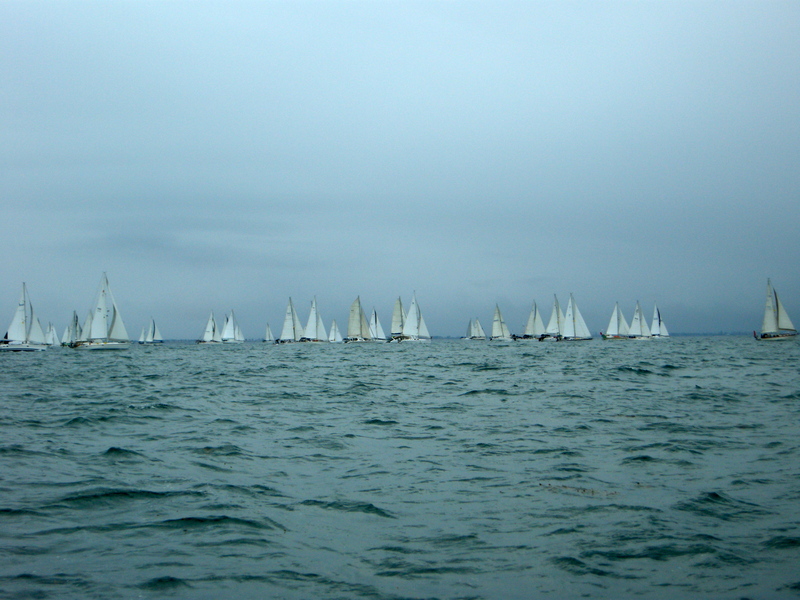 The clouds were low and the wind was non-existent as we motored toward the parade area and starting line. In spite of the bad weather, the fire boat cheered us on with a watery salute, the TV cameras recorded the event for the evening news, the gun sounded and then we were off! Of the 163 entries for the Baha Ha Ha, about 140 or so actually crossed the line, with plenty of fanfare, horns tooting, water guns shooting, and smiles all around! The Happy Dance crew is ready to go! Happy Dance stayed back in the pack as the boats sailed across the start, and we enjoyed seeing all our fellow cruisers for the first time. It took quite a few hours for the boats to really start dispersing, but by the time darkness fell on that first night we were nearly alone with only a few other boats showing on our radar. 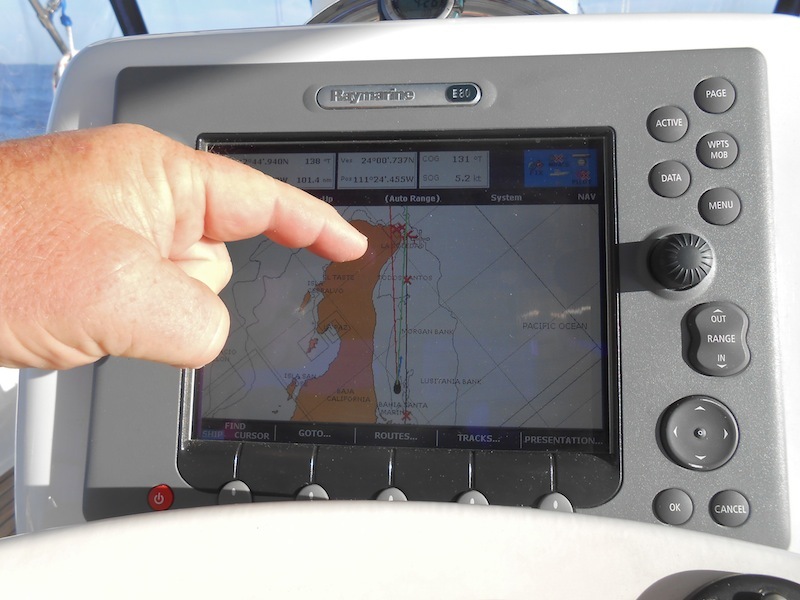 The first 24 hours were pretty uneventful, as we went through the process of correcting a few glitches in the running rigging, and teaching our new crew the systems and specifics on Happy Dance. The next two days and nights of the 350 mile leg one were a different story completely! 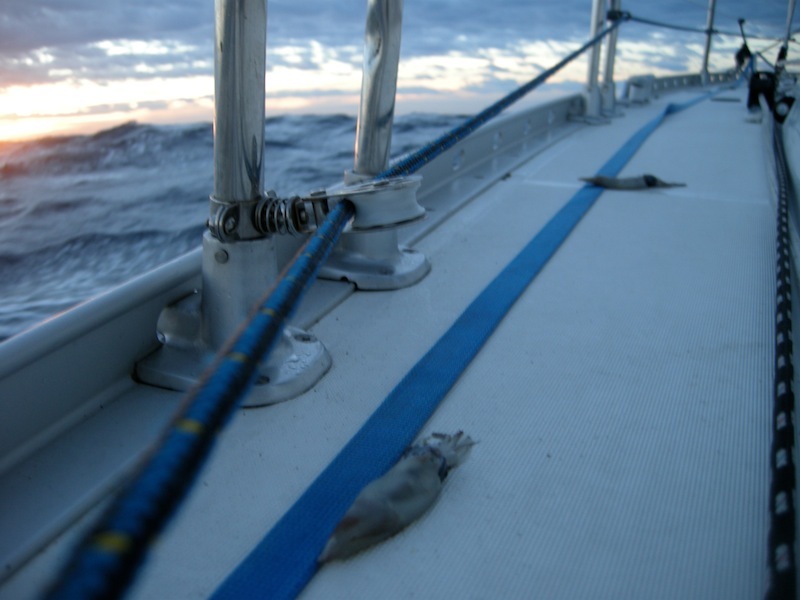 We had been watching the winds build all day on the second day, and as the winds built so did the seas. 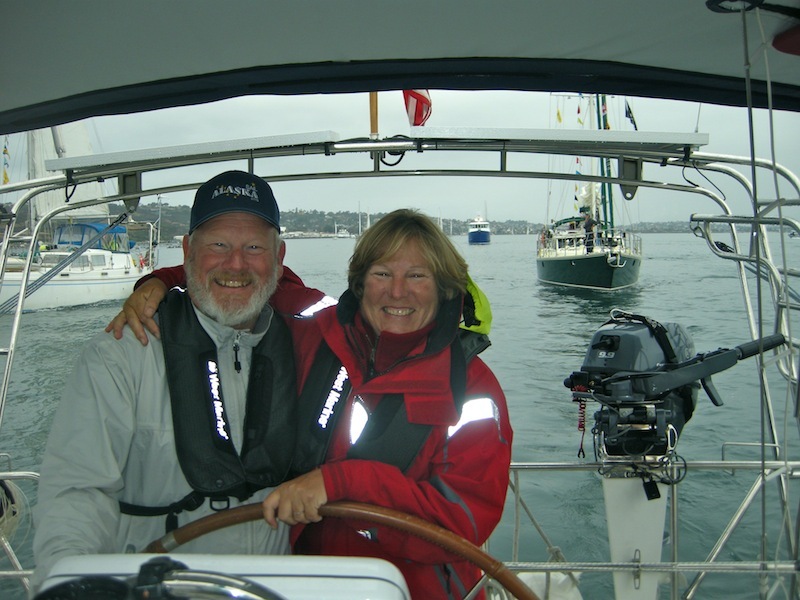 We continued to reduce sail, until we were finally sailing with a double reefed mainsail and a reefed storm jib; a couple of hankies on a pole! 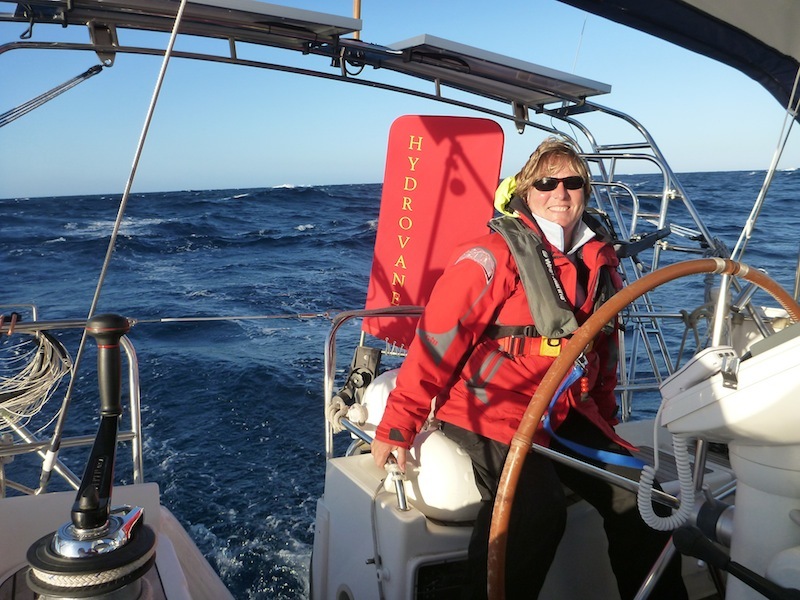 The winds were steady at 20-24 knots, with an occasional gust in the upper twenties, and the wave heights were nearing 8-10 feet with a short interval between them – in other words – hang on! Hydie our Hydrovane is driving while I hang on!!! The waves look pretty big when they sneak up on you…thankfully a following sea!! A fellow Ha Ha-er enjoying the ride. Unfortunately our candlelight 3rd anniversary dinner had to be postponed since the boat was being tossed too much to allow for a hot meal, but Karina did whip up some homemade guacamole to go with our ginger beer. It was a quick moment of celebration before a gorgeous sunset, and then the real work began. Monitoring sail trim, course, radar, and lights of boats nearby in 10 foot seas is tiring, but even more tiring is trying to sleep inside a washing machine on spin cycle! Luckily Marty and I are short enough that we can sleep sideways on the bed when necessary, with our heads on the uphill side of the tack that we’re on! Happy Dance performed excellently, and we only took one small wave over the stern – so it was a dry and controllable ride even when surfing down the bigger rollers. After 48 hours of a rough roller coaster ride we finally pulled into Turtle Bay / Bahia Tortuga. Marty and I had both caught a flu or cold bug in San Diego and were pretty much wiped out after 3 days/nights of little sleep, so when the anchor was set we headed to bed. Karina and James, our crew, were a bit more energetic and headed to town. Marty was bummed to miss out on the softball game that was planned with all the kids from town, but getting over our hacking coughs was a higher priority. 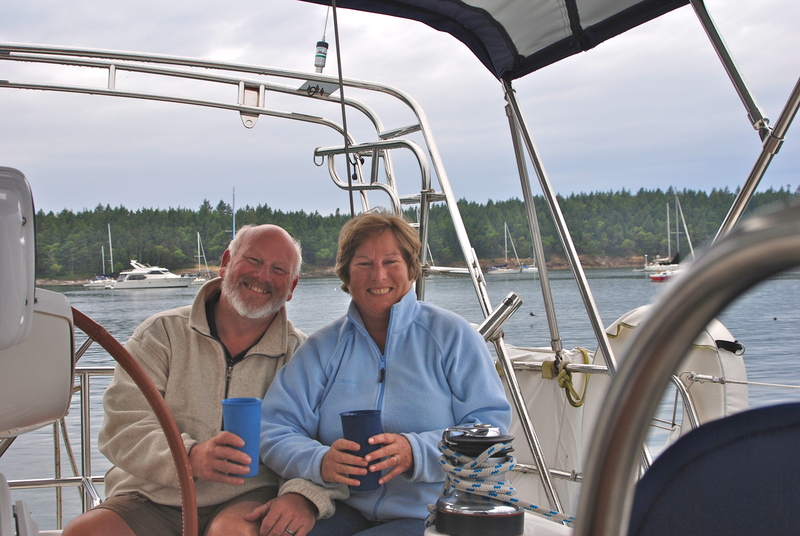 We spent two blissfully quiet nights at anchor and headed back out to sea on the morning of November 2. 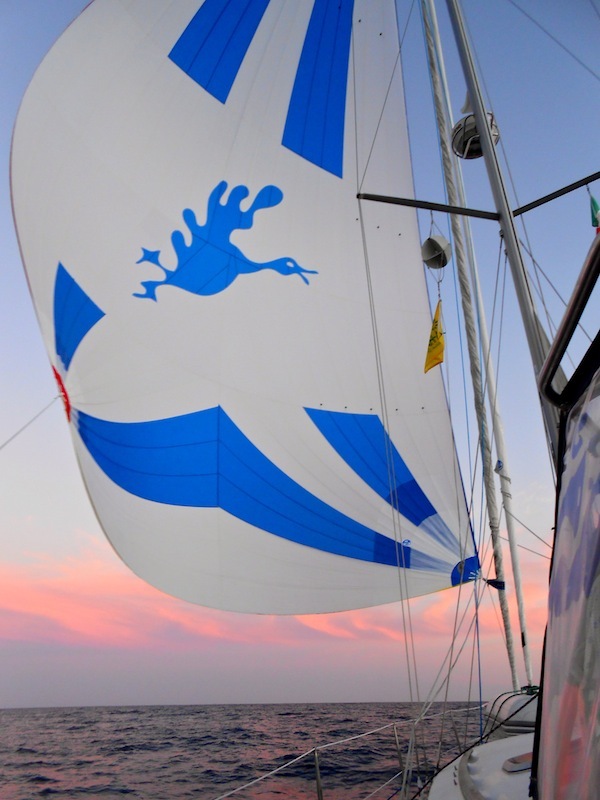 The winds were light for the start of the second leg, but we put up the Goose and headed out under sail. 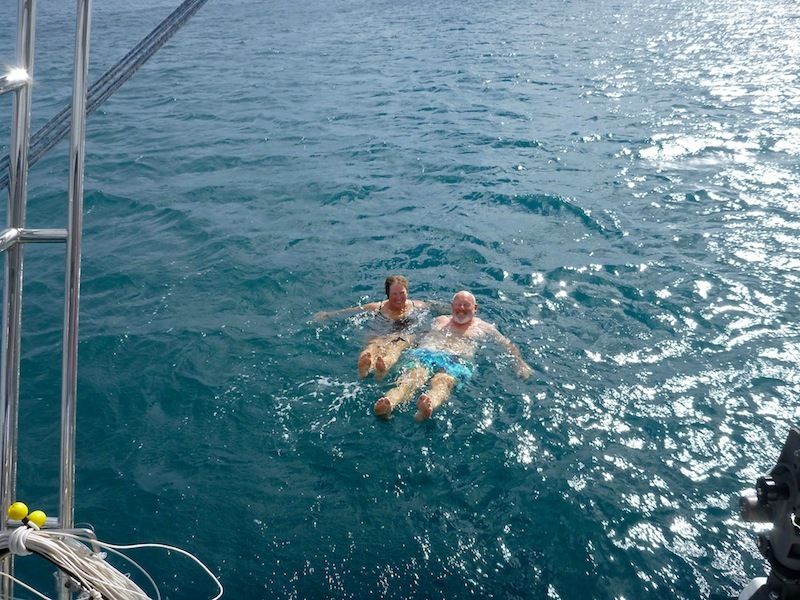 There is nothing quite so awesome as a relatively smooth following sea, 10-15 knots on the stern filling our Blue Goose gennaker under blue skies and warm sunshine. Then, to make it even better – fish on! We caught two skip jack tuna in about 20 minutes, then put the line away since we had plenty for dinner. 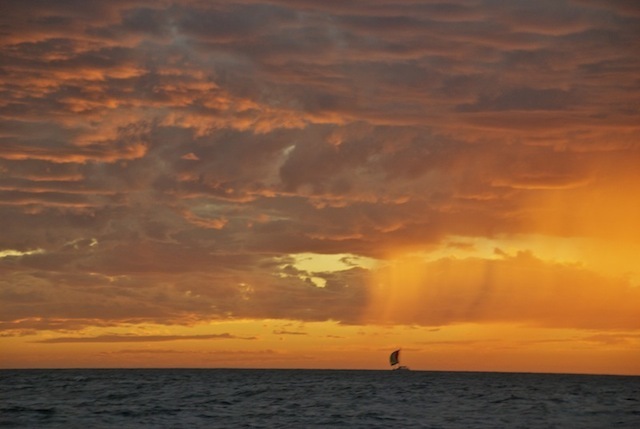 Being at sea provides sensational sensory overloads; the views during the day include visits from dolphins, an occasional blow from a whale in the distance, huge turtles swimming on the surface, and of course the blue, blue water stretching all the way to the horizon in every direction. At sunset the show is spectacular and watching a fiery red ball sink into the sea is something we’ll never tire of. Then darkness descends and the stars are so bright that they leave silver trails on the water. As the night sky turns the stars extinguish themselves into the ocean one by one, to be replaced by another beautiful sunrise. 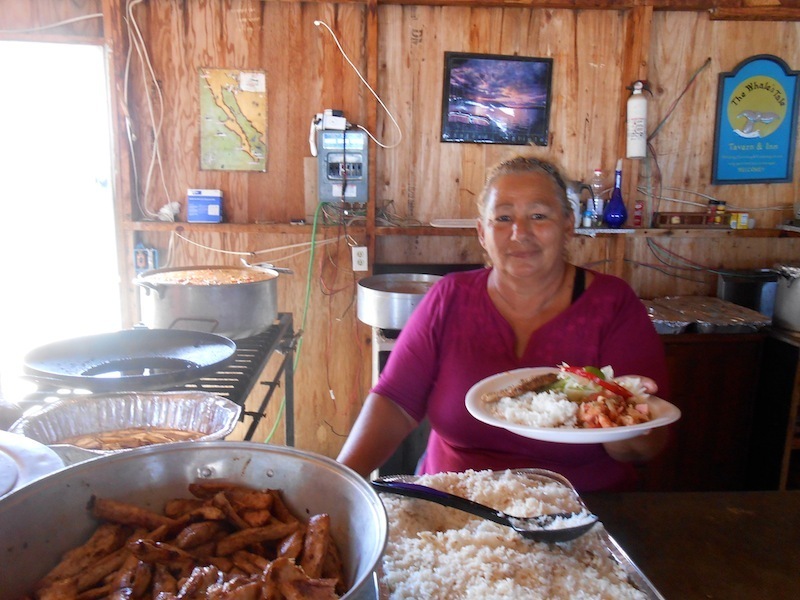 This lady cooked and served up vats of yummy fish stew…amazing! 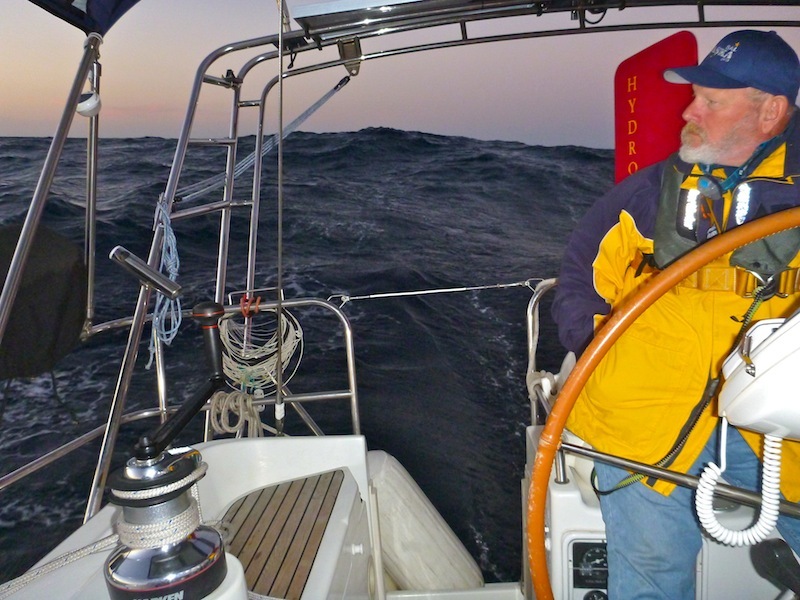 We sailed the entire second leg, which was about 250 miles or 48 hours. The anchor went down in Bahia Santa Maria at about 9am on the third morning after leaving Bahia Tortuga. Marty and I were finally starting to feel almost human again (though my deep bedroom voice would remain for another week..), so we ventured into shore for the annual Baja Ha Ha beach party! A group of resourceful Mexican musicians drive 100’s of miles across the desert to bring their band equipment to an empty beach bluff for one day a year. Another group of hard workers put together a feast of fish stew, grilled fish and plenty of ice-cold beer for a couple hundred happy Ha Ha-ers. It’s an amazing annual effort performed by a great bunch of local fishermen and their families…and is much appreciated! 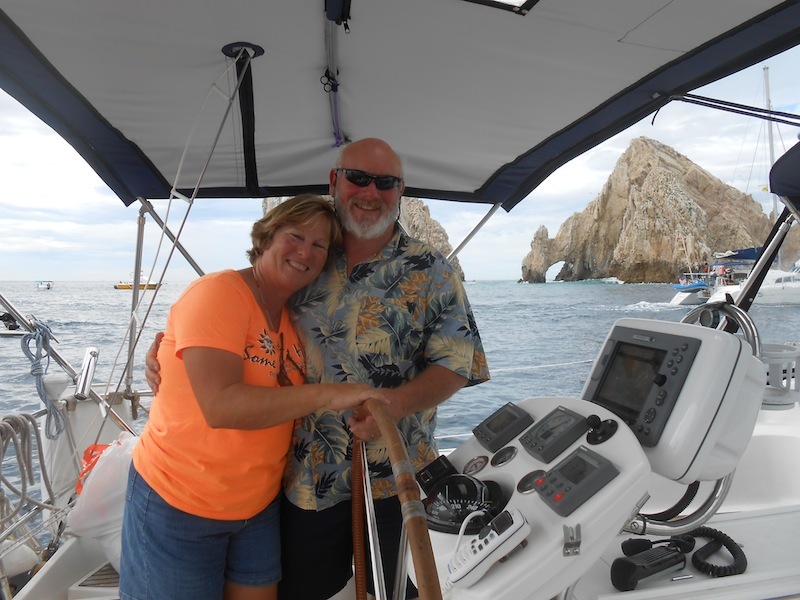 We danced the day away, then headed back to the boats to get ready for the final leg…Cabo is close!!! Since the final leg was about 36-40 hours for Happy Dance at an average of 5 knots/hour, we decided to leave before the pack and headed out at 4am. 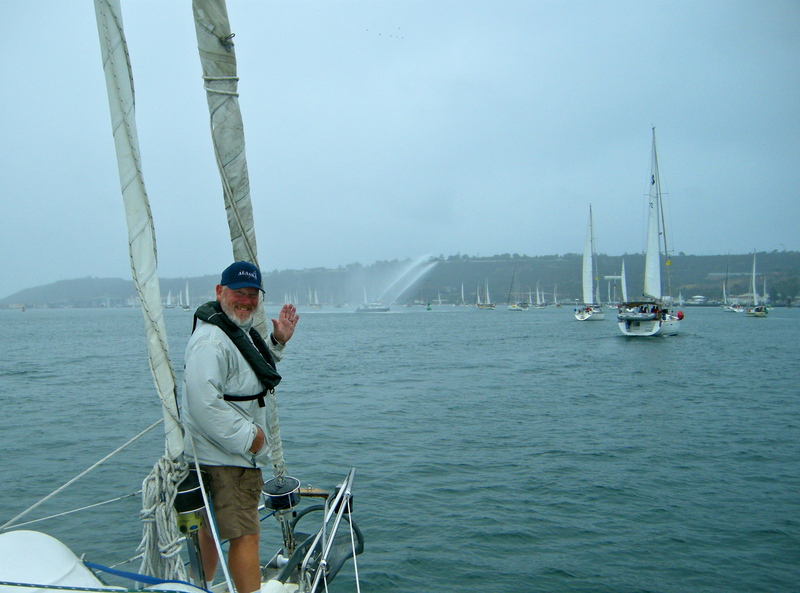 We had a few boats leave when we did so there were some friendly lights twinkling around us as we left the bay. 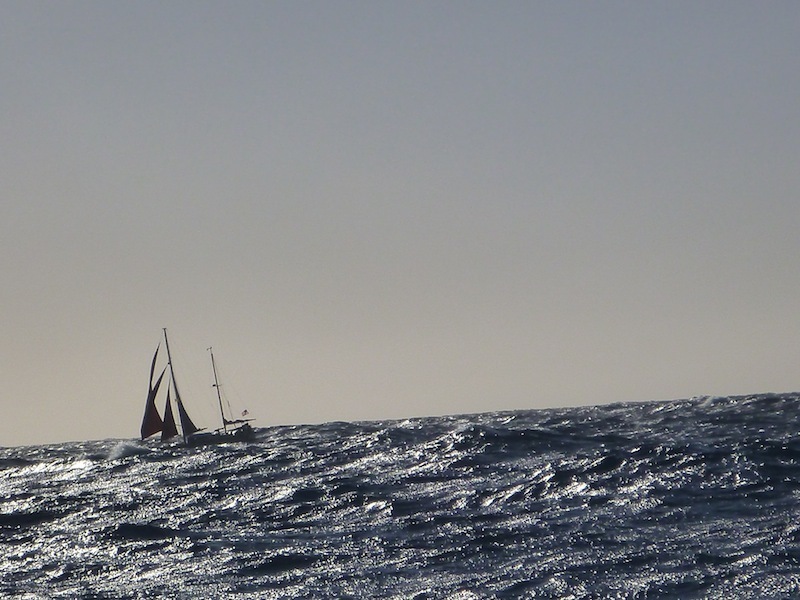 There wasn’t much wind on this leg so we alternated between sails and iron genny, but we made good time and the weather just got warmer and warmer. 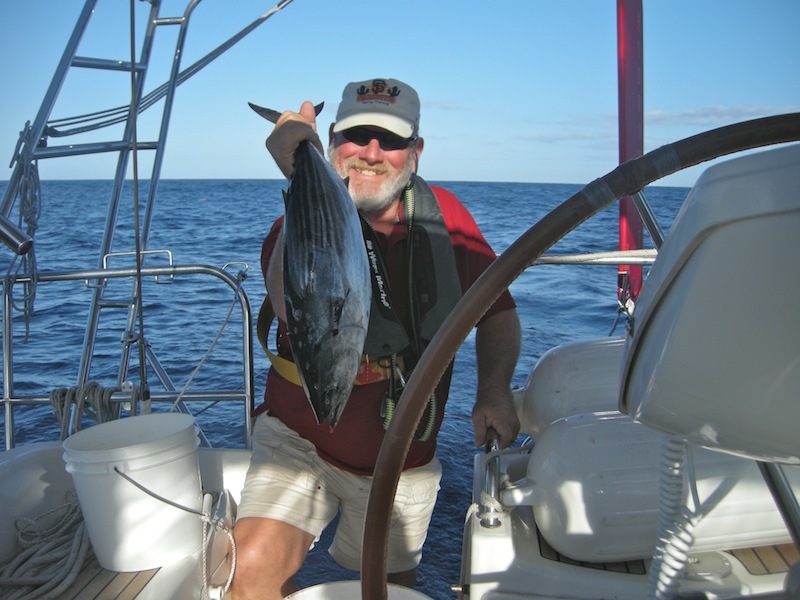 We also caught two more tuna and had many more visits from happy dancing dolphins! Our final night at sea was marked by shooting stars, gentle seas, and light to non-existent wind. 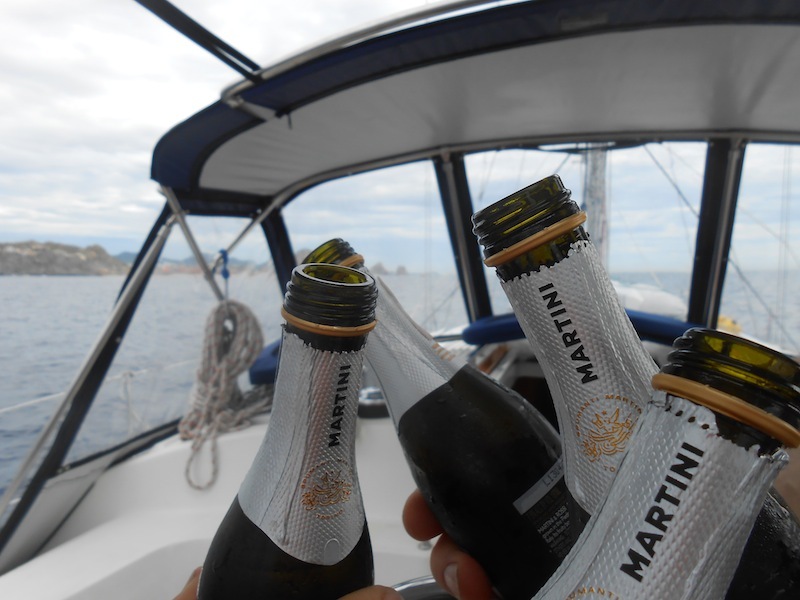 Rather than listen to the sails flog we decided to turn on the engine and get to Cabo! 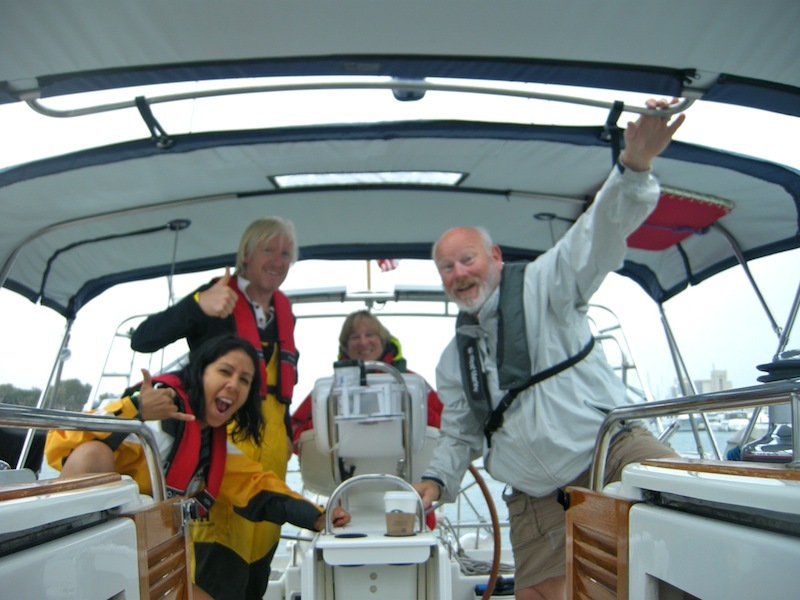 We arrived under gray skies and even a few raindrops, but nothing could have dampened the excitement we felt as we rounded Land’s End and viewed El Arco! Marty and I have been to Cabo quite a few times but arriving in our Happy Dance is a feeling that tops them all. Plenty of big smiles and a few tears as once again we fulfill another item on our list of adventures. In Cabo we anchored out, in a very lumpy loud anchorage. 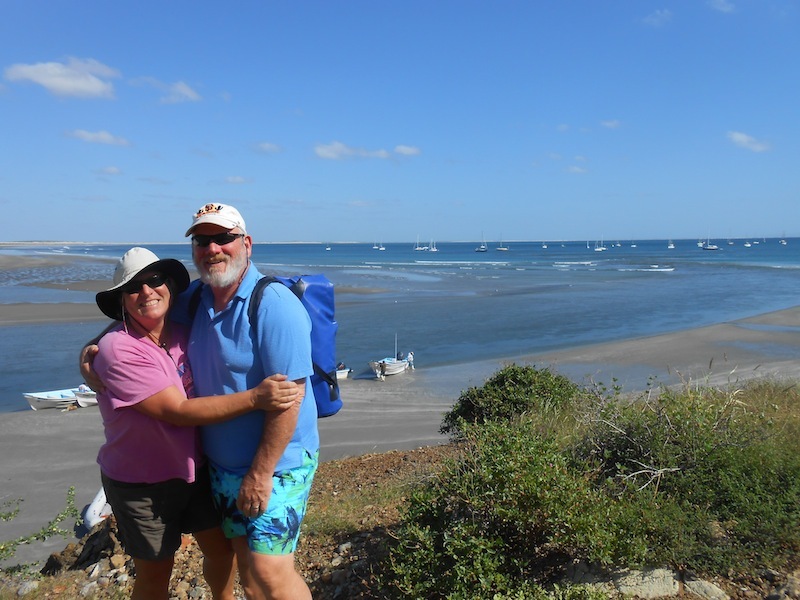 We did enjoy jumping off the boat into warm salty waters though, so that made it worthwhile. We visited a few of our favorite old haunts and had a few margaritas and some lobster. After the Baja Ha Ha parties ended (we came in third place*!!) we left Cabo to move up the coast a bit to wait out a big Northern that is blowing down the Gulf. The Happy Dance crew and our friend Cheryl from Tramp celebrate at Slim’s Elbow Room. 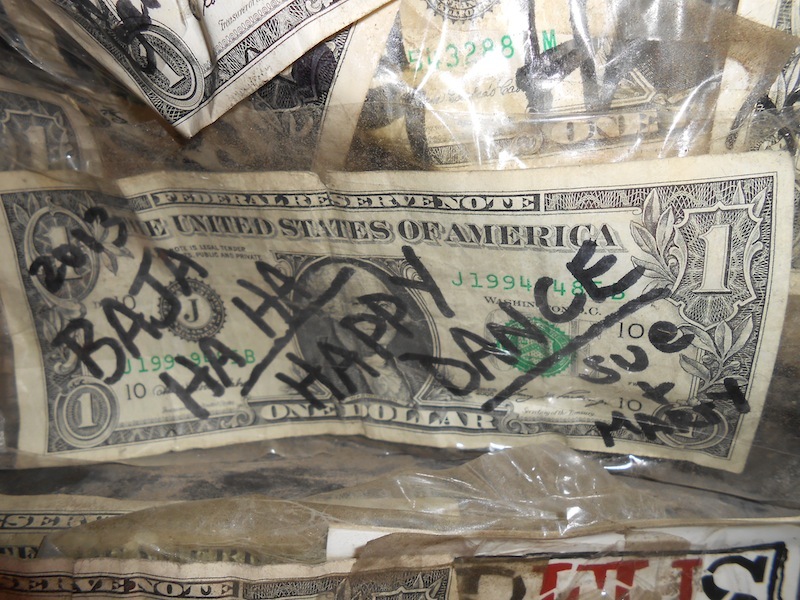 Adding our third dollar to the wall at Slim’s. The last one was from our honeymoon! We keep looking at each other and saying…guess what? We sailed to Mexico! Guess what? We’re in Mexico! Guess what? We did it!!! Yep, we’re proud of ourselves, and granted there have been a gazillion others who have accomplished this and even greater sailing moments. But this is our moment, our adventure, our new life. We are here under a blazing hot sun, swimming, sweating, and swimming some more. We’ll soon make another U-turn to head back north up into the Gulf of California where we’ll anchor out in quiet bays, kayak, fish, swim, hike and totally turn off the clock. We are looking forward to forgetting about any schedule and just staying where we want for as long as we want. It’s really a whole new chapter in the upcoming book entitled…???? (we’ll be taking advance orders soon!). 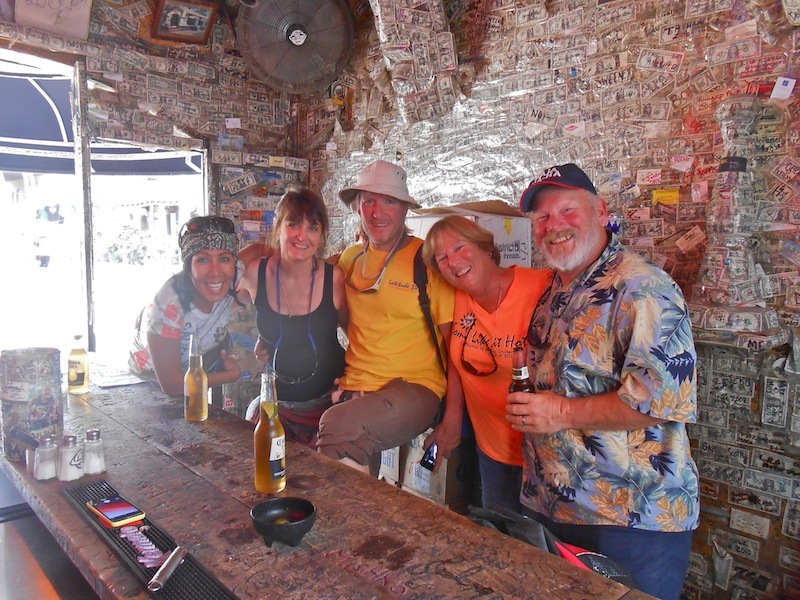 So what are my lasting impressions of the 9 days from San Diego to Cabo San Lucas? Stars; incredibly bright, prolific stars. Seas; steep, confused, rolling seas. Sunsets, sunrises; varied, vibrant and awe-inspiring. Sleep; totally lacking! Self-reliance; four people relying on each other for their survival. Sweet; an adventure so rare, we are privileged to savor it. Don’t worry about the ones left behind … We will live our cookie cutter lives while living vicariously thru your ‘escapades’. Sorry, I had to say it! LOL. Aloha from my cookie cutter life currently happening in Maui! Aloha amiga!! Thanks for the nice words – enjoy cutting cookies in Maui!! 🙂 Lots of love to you! your description of all that happened is great. Enjoyed sailing along with you. Most of us have seen sunsets, waves from the beach and occasionally a dolpin or two, but the STARS would be the thrill for me. I was at Chichen-Itza when they turned out the lights and the millions of stars shining thru took my breath away.I guess now you really are at the beginning of your adventure with no schedule. Instered to hear what you find along the way. Good Speed. Thanks Big D!!!! 🙂 Fun to hear from you and visualize the stars at Chichen-Itza…can’t wait to see that ourselves! We’ll keep in touch as we head north.